WASHINGTON (AP) — After a week of hard-nosed negotiation, diplomatic gamesmanship and no shortage of theatrics, President Donald Trump has announced that the historic nuclear-weapons summit he had canceled with North Korea's Kim Jong Un is back on. The June 12 meeting in Singapore, the first between heads of the technically still-warring nations, is meant to begin the process of ending North Korea's nuclear program, and Trump said he believes Kim is committed to that goal. The announcement puts back on track a high-risk summit that could be a legacy-defining moment for the American leader, who has matched his unconventional deal-making style with the mercurial Kim government. "We're going to deal, and we're going to really start a process," Trump said. He spoke from the South Lawn of the White House after seeing off a senior Kim deputy who spent more than an hour with him in the Oval Office. 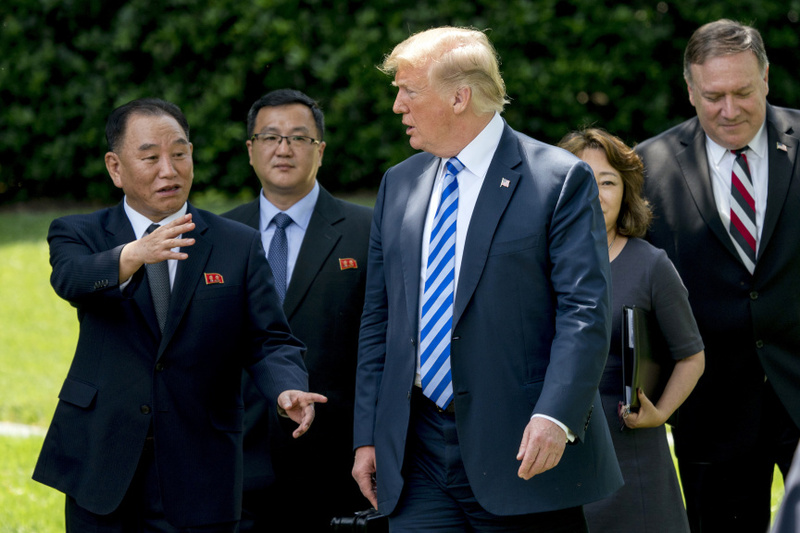 Much had been made of a letter his visitor was bringing from the North Korean leader, but Trump's comments left it unclear when he had even managed to take a look at it. The president said it was likely that more than a single meeting would be necessary to bring about his goal of denuclearizing the Korean Peninsula. He said, "I think you're going to have a very positive result in the end, not from one meeting." In the latest sign of hostility cooling down but hopes kept in check, Trump said he had unilaterally put a hold on hundreds of new sanctions against the North, without Kim's government even asking. "I'm not going to put them on until such time as the talks break down," he said. "I don't even want to use the term 'maximum pressure' anymore," Trump added, referencing his preferred term for the punishing U.S. economic sanctions imposed on North Korea in response to its nuclear and ballistic missile tests. But he said he would not remove current sanctions until the North took steps to denuclearize. Trump warmly greeted Kim Yong Chol, the vice chairman of the North Korean ruling party's central committee, in the Oval Office, where a brief encounter meant for the hand delivery of a personal letter from Kim Jong Un became a longer discussion of areas of disagreement between the two countries. After the meeting, Trump posed for photos with Kim Yong Chol outside the Oval Office, and they talked amiably at Kim's black SUV before he was driven away. Trump told reporters he hadn't yet read the letter from the North Korean leader and added with a smile, "I may be in for a big surprise, folks." But minutes earlier, he had described the note as "a very interesting letter," and teased journalists about revealing its contents. Trump cited increasingly bellicose statements from the North — and ignored messages about summit logistics — when he announced he was backing out of the summit in a strongly worded letter. He cited "tremendous anger and open hostility" by Pyongyang but also urged Kim Jong Un to call him. By the next day, he was signaling the event could be back on after a conciliatory response from North Korea. Trump has declined to publicly acknowledge whether he's spoken directly with Kim Jong Un ahead of the talks. Questions remain about what a deal on the North's nuclear weapons would look like. Trump said Friday he believed Kim Jong Un would agree to denuclearization, but the two countries have offered differing visions of what that entails. Despite Kim's apparent eagerness for a summit with Trump, there are many doubts that he would fully relinquish his nuclear arsenal, which he may see as his guarantee of survival. U.S. defense and intelligence officials have repeatedly assessed the North to be on the threshold the capability to strike anywhere in the continental U.S. with a nuclear-tipped missile — a capacity that Trump and other U.S. officials have said they would not tolerate. Defense ministers from Japan and South Korea offered very different views of the North Korean leader at an international security conference in Singapore. Japan's defense chief urged caution in dealing with North Korea, while his South Korean counterpart said there was no reason to question the North Korean leader's sincerity. Trump has promised that he will provide "protections" for Kim and his government in return for giving up the nuclear program. He also indicated that South Korea, China, and Japan would be prepared to invest in the North to boost its besieged economy.